AAA's Via magazine (September 2013) shows Pacificans Lionel Emde and Renee Batti leaving the San Francisco Ferry Building farmers market with a shopping cart full of goodies. "Our 15 seconds of fame," said Lionel when one of his customers showed him the photo. And Lionel's butcher at the market also showed him the magazine and said, "You're famous." Today the Cincinnati Reds beat the Colorado Rockies 8-3 behind the pitching of Terra Nova High School graduate Greg Reynolds, who went eight innings with five strikeouts. Greg's parents flew to Denver to see the game. •I don’t like that a secretive subcommittee committed to spending $34,720 on promoting the Utility Users Tax (UUT) before it even came before City Council. •I don’t like that when the $10,000 contract for UUT consultant work by TBWB Strategies came before council for approval, the contract was backdated for services ALREADY performed. •I don’t like that the polling consultants hired in secret by the subcommittee discussed the results of their polling with a group of private citizens BEFORE they presented the same report to council. •I don’t like that the UUT “informational” mailer was paid for by ALL the residents of Pacifica. •I don’t like that the UUT “informational” mailer was mailed ONLY to registered voters -- it’s almost as if it were intended only to sway -- uh, I mean -- “inform” likely voters instead of ALL the residents of Pacifica that the UUT will affect, regardless of whether they were registered to vote. •I don’t like council members baldly telling citizens they were elected to represent that they had no plans to make any changes to the UUT when they had already contacted Godbe Research to do this very thing (see: check #22000 in the amount of $12,360, dated 5/31/13). •I don’t like council ginning up a fake financial emergency to make it easier to pass the UUT on an off-year ballot. •I don’t like being threatened with cuts to basic services to get me to support the UUT when our budget has had surpluses for the past two years and our reserves continue to grow. •I don’t like being threatened with cuts to basic services to get me to support the UUT when cuts in employee pay or cuts to spending on outside consultants are not also part of the discussion. 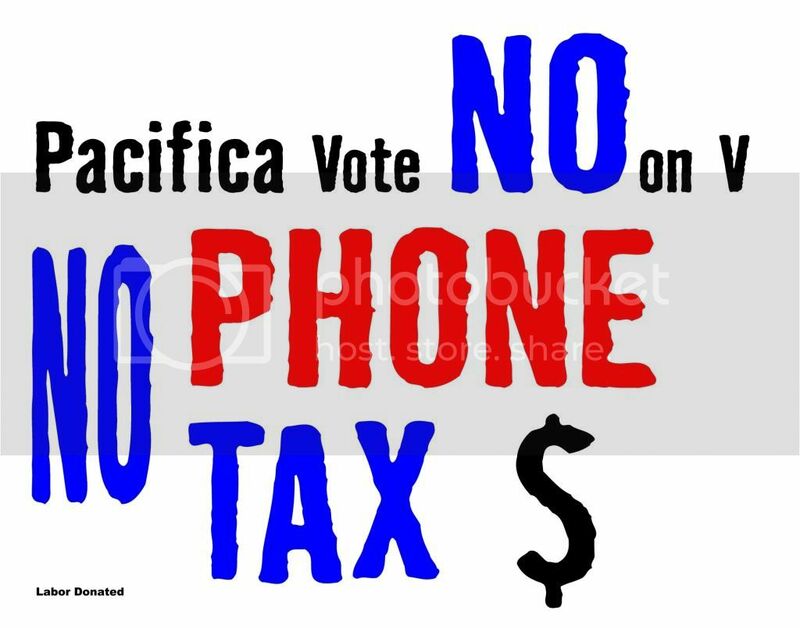 •I don’t like voting for a ballot measure that increases my taxes without telling me exactly how much it will increase them. •I don’t like voting for a ballot measure that doesn’t clearly describe exactly which services are being taxed. Is Internet service taxed? No? What if Internet service is used for telecommunications (VOIP)? Yes? Nobody knows and nobody will tell you! •I don’t like voting for a ballot measure that seeks to mislead voters by stating it will not “raise the current 6.5% rate” while somehow magically increasing the UUT taken in by the city by more than 60 percent. •I don’t like not having faith in our City Council for these reasons because it leads me to believe that the extra UUT money isn’t about the city NEEDING it but merely WANTING it. Which is a big difference. •I don’t like the UUT increase. Phonomania: Does This Look Familiar? While some Pacificans are aware that Caltrans recently released the Final Environmental Impact Report (FEIR) for the highway widening (euphemistically known as the Calera Parkway Project), very few people are aware that the public comment period ended when Caltrans filed its Notice of Determination (NOD) with the State of California effective August 8, 2013. Under the California Environmental Quality Act (CEQA), the lead agency files an NOD after the agency has approved the FEIR and determined that the CEQA process is final and complete. Public comments on the FEIR's adequacy are no longer relevant nor will they be accepted. This includes any comments by agencies involved in the highway-widening process such as the City of Pacifica. CEQA does not require public comment on the FEIR. Under CEQA, the only way to challenge the FEIR at this point is to file a lawsuit no later than 30 days after August 8, 2013—the date of receipt of the NOD. Please pass this information around publicly because this massive bureaucratic and engineering process is moving forward. Those who felt assured that the City Council would listen to its constituents have been misled. The city should have held public hearings and, just as important, should have interacted with Caltrans as a partner in the CEQA process by tailoring this project to our city's unique needs. Additionally, and counter to its stated goals, Pacifica's Economic Development Committee refused to listen to requests to discuss the economic impacts of the highway widening on Pacifica businesses. Construction on this project cannot begin without a Coastal Development Permit (CDP) issued by the California Coastal Commission (CCC). To date, no application for a CDP has been submitted to CCC. The city can choose to apply for a CDP on its own and hold public hearings prior to approving the CDP, where approval of the permit is based on the city's own Local Coastal Plan (LCP) and portions of the Coastal Act. Or the city can agree to a Consolidated Permit with CCC and Caltrans, where approval of the permit is based on the Coastal Act. If the city approves the CDP, it can be appealed to CCC. Let's hope the city properly informs and updates the citizens of Pacifica about the upcoming CDP process. The best outcome for democracy in Pacifica would be for City Council to hold public hearings on the CDP and encourage public comments and discussion of specific impacts to Pacifica. Promises made by some council members, both publicly and privately, to hold hearings on the FEIR were not kept. Citizens should be frustrated and angry with their elected officials and demand to be heard. Caltrans window dressing, i.e., calling Highway 1 widening the Calera Parkway Project, is pure Potemkin Village propaganda. It’s vintage Caltrans, an iron fist in a velvet glove, steamrolling a hapless city with an impotent staff and council while spoon-feeding bland euphemisms to an impressionable public. For historical reference, read about how Caltrans plowed the Foothill Freeway (Interstate 210) right through the heart of Pasadena, dividing the community, much as it did to Sharp Park when it dug the trench for Highway 1. Which Websites Share Your Personal Information? If your Riptide comment fails to appear here on this blog, it may have become lost in the Typepad software system that we use to post your submitted comments, or it may have violated our terms of service (no personal attacks, no name calling). If you suspect the former, please resubmit your comment, but if it still does not appear in the comment thread, email mayburrito@goofbuster.com and let us know that you are having problems getting your comment posted. We will try to work it out. We post all legitimate, civil comments based on facts and issues, but please don't bother sending anything defamatory or derogatory, otherwise it will be deleted. "Black sheep" is rather an odd phrase to choose to epitomise worthlessness. Why sheep? Black cats are supposed to be lucky and badgers, dolphins, pandas and penguins, which are all primarily black, are considered cute. First thoughts might suggest that it came about because of the linking of black things with bad things, which is a long standing allusion in English texts -- black mood, black looks or (where I come from) the Black Country. It may also be because shepherds disliked black sheep as their fleeces weren't suitable for dying and so were worth less than those of white sheep. which Coverdale had translated from a German source text. Like bloggers and web publishers these days, the writers of early bibles copied from each other without checking their sources. Other bibles have the text as ‘all the browne cattell among the sheepe’ or ‘every speckled and spotted sheep and every black lamb’. In the original texts, the Genesis 30:32 story is that the shepherd Jacob suggested that he remove any spotted, dark or otherwise identifiable sheep or goats from his master's flock in order to be able to later demonstrate that he hadn't stolen any white ones. The 'black sheep' were actually a mark of integrity rather than disrepute. The 'Chinese whispers' of the early bible versions caused the original meaning to become lost and confused readers into the belief that the dark sheep were removed because they were worthless. Cast out all the Prophane people among us, as drunkards, swearers, whores, lyers, which the Scripture brands for blacke sheepe, and condemnes them in a 100. places. "We speak figuratively of the one black sheep that is the cause of sorrow in a family; but in its reality it is regarded by the Sussex shepherd as an omen of good luck to his flock." Like most nursery rhymes, the interpretation of the text is a source of debate. It has been suggested in recent years that it contains a racial slur which, to this reader at least, seems speculative and based on little more than it includes the word 'black'. If there is a negative connotation it is that the rhyme may refer to the unpopular export tax on wool imposed in 1275. That country lore was overtaken by the figurative use of the 'black sheep' that we now commonly use.